Here is a video of me talking about the VGN at the PS Engage conference. The following material comes from a paper I recently finished as part of my studies. I took the opportunity to combine what I have learned about Information Management and Collaboration and then apply that knowledge to something that might be practical. If you want the paper you can find it on the Articles page, here is a somewhat abridged version for your perusal and comment. By the way, if you do comment I promise to get back to you, however my response may not be immediate. 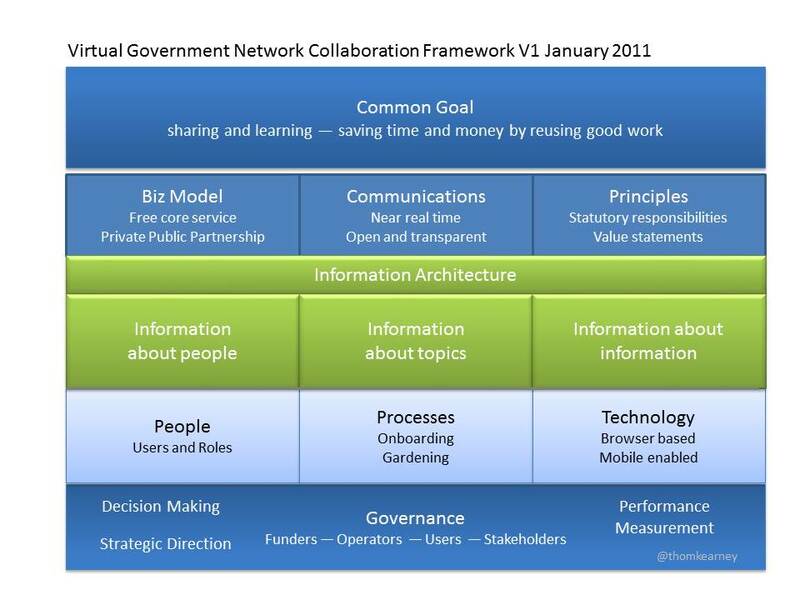 The framework elements are generic in the sense that they could apply to any large-scale collaboration network; in this example they have been populated with the Virtual Government Network in mind. Successful communities share a common goal. Sometimes the goal is urgent and short-lived like when responding to a crisis, other times it is more subtle and long-term, like creating a high quality of life. In terms of government interests in supporting their jurisdictional economy, most would agree with Velez when he says that the ability to create, access and apply knowledge is a fundamental determinant of global competitiveness (Valez E., 2008, as cited by MacDonald, 2010). Although she was talking about how the disciplines within behavioral and social sciences should make themselves mutually consistent I think this principle applies to government as a whole and the Virtual Government Network is for people that want to reduce xenophobia. From a more practical perspective the Virtual Government Network is about sharing and learning, saving time and money by reusing good work rather than reinventing. The underlying assumption is that more effective and sustainable government is more likely if we work together. This becomes the stated goal because it is the easiest to understand and likely the most relevant to potential users of the network. The network would initially be provided free of charge, paid for by profits that would be generated from the sale of training and associated professional services. As the network evolves the intention would be to acquire funding from governments, perhaps via the Public Service Chief Information Officer Council (PSCIOC) or a Public Private Partnership. The sustainable model will depend on reaction to the proposal and community interest. Communication is consistently identified as one of the key ingredients for successful collaboration and an important part of any successful network. In this framework I identify two key characteristics of the communication infrastructure as being in near real-time and transparent and open. For the network to be effective in responding to real-time events, communication from operators of the network and between network members themselves needs to be fast and accurate. Messages between members and groups are completely driven by user content and the system simply needs to provide mechanisms for delivering the messages in a timely and reliable manner. For messages from the operators to the members some crafting of messages and agreement on those messages may be required. This communications process interacts with governance processes and impedes the free flow of information. Careful attention to process design will be necessary to ensure that this kind of messaging can occur quickly. Fortunately the principles of open and transparent will minimize the amount of messaging that requires “crafting”. By operating in a transparent fashion and building in opportunities for any interested member to participate in the governance of the network, the number of messages that need explicit approval of a governance group should be kept to a few per year. Governments share similar responsibilities around issues like providing for freedom of information while protecting privacy or ensuring that information is archived for future generations. Intellectual property needs to be protected and disposition authorities applied. The framework needs to respect these in a way that is acceptable to all parties. This idea is not new, in 1948 Urguhart called for government confidential reports to be reviewed periodically to see what scientific and technical information could be released into the general pool of knowledge (Duff, 1997). Reviewing confidential information is of course an added cost, and as the body of confidential knowledge increases the sustainability of that review decreases. By keeping the body of confidential knowledge as small as possible the system will be more efficient. Assuming that we believe that the value of information to society increases with access, shifting our mindset from one of “need to know” to “need to share” should be a top priority. The concept of transparency is considered by some to be so critical to the evolution of democracy that it has been enshrined in legislation. Canada’s Access to Information Act is an early example while the Open Government Directive from the United States Federal government is a more recent and dramatically more complete example of the transparency principle being applied. Finally, I believe that transparency is essential for establishing and maintaining the trust between members that leads to a willingness to share. To mitigate the potential for political dispute the virtual government network should be a neutral space. Not a place for advocating particular political viewpoints, but rather a safe common ground, where the focus is on sharing knowledge and making government more effective. The articulation of the broad community values is something that should be undertaken in consultation with the community, so I am not going to try and develop these any further at this time. Information about topics represents the explicit knowledge content of the VGN. The intention is to build a repository of shareable stuff. Any information that could help another jurisdiction or links to such information would be valid. Intellectual property is an issue to watch here, if protected work is posted the rights to that work will have to be managed. The simple approach is telling users they are expected to only post unprotected work. In this scenario the VGN will need processes for monitoring for protected material and quickly resolving any complaints. A more sophisticated approach would be to build some kind of digital rights management into the network, perhaps based on the creative commons licenses. The primary users of the network are government employees at any jurisdiction in Canada. These users are authenticated and agree to a terms of reference that is acceptable to their employer. The community is broadly defined by the term Public Servant. An issue arises with the inclusion of consultants, contractors and other suppliers of services; this shadow government is estimated to be worth $25B at the Federal level alone (Ottawa Citizen, 2010). It may be that there will have to be two types of users and two different entry levels of user. Another consideration is whether to permit users from jurisdictions outside of Canada. Types of users will have to be defined along with various roles that each type can perform. The following is a preliminary list of potential user access levels. L3 Operators have some additional edit privileges and can approve certain events like group creation. In addition to Members and Operators other relevant people are those providing funds and other stakeholders that identify themselves, i.e. Unions, political parties, governing parties, etc. Operation of the VGN will involve many processes. For the purposes of this paper I have identified two broad categories that I believe are particularly important. The general concept of information value within the VGN is that users decide what is important. Content value could be some mix of attributes such as: source value, user votes, user links to the information, # citations, comments and other empirical and subjective characteristics that can be measured over time. These ideas should be reflected in the non-functional requirements for the supporting platform. Governance mechanisms should be as inclusive as possible and follow the principle of transparency. Provide a forum and guidelines for funders, operators, users and stakeholders. The framework is intended to be a fairly holistic, top level conceptual architecture that might be used to guide the creation of a Virtual Government Network. It is a broad brush, high level view; there are improvements to be made, both in the generic framework and in the details. To move forward each element needs much more detail and discussion. Maybe we can build something like this, maybe not, either way; I hope the framework is of use to others. Please comment and build on it. This entry was posted in Collaboration, Gov 2.0, Positive Change, Virtual Government Network, Web 2.0, Work in Progress. Bookmark the permalink. Enough framework already. We need action! Agreed, so who is going to help build it? Thank you for the time and thought that went into this post. Very useful indeed. You might want to consider the new Print technologies that could help make this happen faster rather than slower. My thought is that in government, Print has to be part of the mix to go mainstream. So maybe we can imagine this kind of technology being used to assemble and print customized polices and procedures using a shared database of content generated by all the jurisdictions? What do you think the first step in making this a reality would be? Recently came across this a input for the Principles box. – No gatekeepers. The web is decentralized. Anyone can start a web site. No one has the authority (in a democracy, anyway) to stop you from putting up a shingle. – An ethos of the commons. The web developed over time under an ethos of community development, and most of its core software and protocols are royalty free or open source (or both). There wasn’t early lockdown on what was and wasn’t allowed. This created chaos, shady operators, and plenty of dirt and dark alleys. But it also allowed extraordinary value to blossom in that roiling ecosystem. – No preset rules about how data is used. If one site collects information from or about a user of its site, that site has the right to do other things with that data, assuming, again, that it’s doing things that benefit all parties concerned. – Neutrality. No one site on the web is any more or less accessible than any other site. If it’s on the web, you can find it and visit it. – Interoperability. Sites on the web share common protocols and principles, and determine independently how to work with each other. There is no centralized authority which decides who can work with who, in what way.